With Facebook Messenger app for iOS devices, you can chat and make FREE voice calls with your Facebook friends wherever they are - iPhone, iPod Touch or web. In addition to supporting standard chat and mobile VoIP calls, Facebook Messenger also comes with additional cool features that allow users to easily send pictures, browse message history, view a friend's wall, use emoticons, receive instant replies with Apple Push Notifications, and setup sound notifications and multi-tasking support – all right from within the application. 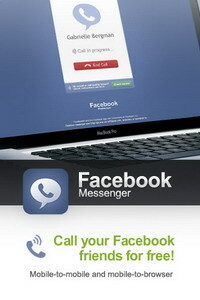 Facebook Messenger for iOS is available for download $0.99 on the App Store in the Social Networking category. 0 comments on "Facebook Messenger iOS app enables voice chat between Facebook friends"